Justin Wylie, who homered to score Big Train's first run on Tuesday, waits in the on-deck circle as outfielder Jacob Westerman (San Francisco) bats. 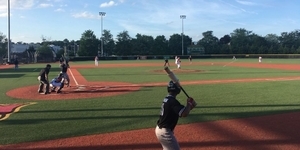 The Cal Ripken League’s perennial championship contenders clashed for the first time this season in Baltimore on Tuesday night, with Big Train defeating the Baltimore Redbirds, 7-4. Big Train would go on to score three more runs that inning thanks to five walks and a Baltimore error to go up 4-0. After second baseman Fox Semones (James Madison) drove in shortstop AJ Lee (Maryland) in the third, the Redbirds cut the lead back to four before Bethesda tacked on two more in the fourth inning, making it 7-1. Big Train’s bullpen would protect that lead for the rest of the ballgame, allowing three runs in five innings. Big Train will continue its road swing on Wednesday when it travels to Virginia to face the FCA Herndon Braves (3-2) at 7:00 p.m. The Braves currently trail Bethesda by two and a half games in the Cal Ripken League south division.